Summary (contains spoilers): The issue starts in the year 736 AD. Li Park (Iron Fist) and a sorcerer named Xun are battling against the demon Cyttorak. Cyttorak wants humanity to worship him, but Iron Fist and Xun manage to banish him from Earth. 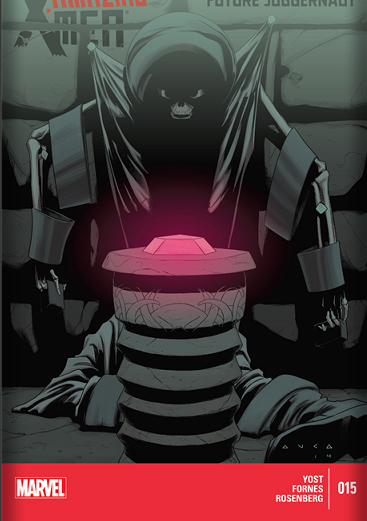 Cyttorak creates a gem which would allow him to have an avatar on Earth. This gem would come into the possession of Cain Marko, which is what transformed him into Juggernaut. Over the years, his avatars failed to push his will on humanity, and the gem got lost. That brings us to the present day. The ruined temple Cain Marko where found the Gem of Cyttorak has been rebuilt. Several armed Thai men go looking for the temple in Korea. They enter the temple and found the gem. Back at the X-Mansion, Colossus wakes up from a nightmare. He can hear Cyttorak calling to him. He's also sharing a bed with Domino. Go Piotr, you old dog! Colossus ends up painting a picture of he rebuilt temple. He realizes that the gem is back on Earth. Meanwhile, Scarlet Witch is trying to teach Pixie how to better use her magical powers. Pixie is trying to put Rockslide to sleep, but ends up causing him to explode instead. Nightcrawler insists that they should try again. It's good to have a test dummy that you can rebuilt. Piotr tracks down Storm and tells her the Gem of Cyttorak is back. Storm puts together a team to investigate, but tells Piotr he will be staying here. Storm doesn't trust Piotr and tells him that he's weak. She also says that the only reason he was allowed to come back to the school was that Logan could keep an eye on him, but now that Logan's dead, she no longer wants that burden. Storm and her team arrive at the temple. Inside the temple, the men who tracked it down have been ripped apart. The X-Men also encounter some kind of demonic creature. Back at the school, Piotr tells Pixie that she needs to take him somewhere right now. Piotr is one of her oldest friends, and she's seen people go through far worse than tempted by the Gem of Cyttorak. She treats Piotr like something she found on the bottom of her shoe, and that really bothered me. I don't really fault Yost for this. This is how Storm has acted for a long time now. But, I am still pretty sick of it, and it definitely affected my enjoyment of this issue. One thing Yost did really well was to keep things light. I suspect that this is going to be an angsty story arc over all. We already got some hints at that here, especially in terms of Storm and Colossus. But, there was a lot of humor here. My favorite moment was when Piotr asked Pixie, "What would Wolverine do?" and she responded, "He'd team up with a teenage girl and go kill bad guys." I also like that Rockslide has basically become this generation's Iceman. A goofy character that the rest of the team is not sure why they keep him around. It definitely works well! I've liked Rockslide since New Mutants, and I'm glad to see him getting some screentime with the main team. The art on this issue wasn't anything special, but at the same time, it also didn't detract from the story. I did like the design of the Cyttorak monster that showed up in the end (pictured above), but there wasn't much else here that really stood out for me artwise. My one big concern from this issue is something I have noticed a lot in Amazing X-Men. Too many of the stories have just been long arcs for the sake of having long arcs. I enjoyed the return of Nightcrawler story...but it went on forever. Same with the Wendigo arc. Did we really need 6 issues to tell a story about people eating tainted meat and turning into monsters? This series constantly seems like it's intended to read as a trade paperback. The problem is, when you are reading it month by month, it often feels like nothing really happens. We get a quick history of Cyttorak, some characterization, the characters find a monster, and the issue ends. I did enjoy what was here, but it definitely didn't feel like there was enough of it. I also have to admit, I was really disappointed that we didn't get Cain Marko here. I've been a fan of Cain since Chuck Austen turned him into a much more interesting character. People rip Austen's X-Men run all the time, but anything bad he did was balanced out by the fact that he took Juggernaut from a one-note character to being something far more complex and entertaining. Amazing X-Men has been an entertaining book throughout it's current run, and this issue was in the same vein. I just wish they would move the stories forward a little faster. There was just way too much padding here. Some great character moments throughout this issue. I really hate bitchy Storm. They have ruined her character! Issue ends basically just as it's starting to pick up. 3.5/5 – I actually liked this issue more than you might think from the review. I've been a Juggernaut fan for a long time, and I was really looking forward to this arc. What was here was good, but it just felt like there could have been a lot more here.